On The Edge Gallery represents over 40 local Arizona artists featuring a wide range of quality artwork in various mediums. 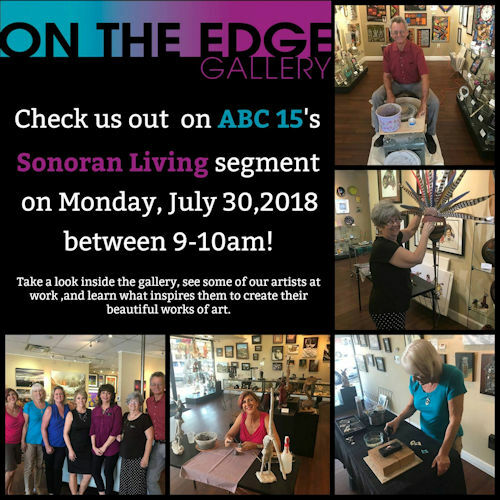 On The Edge Gallery was featured on Sonoran Living on ABC15 in Phoenix, AZ. 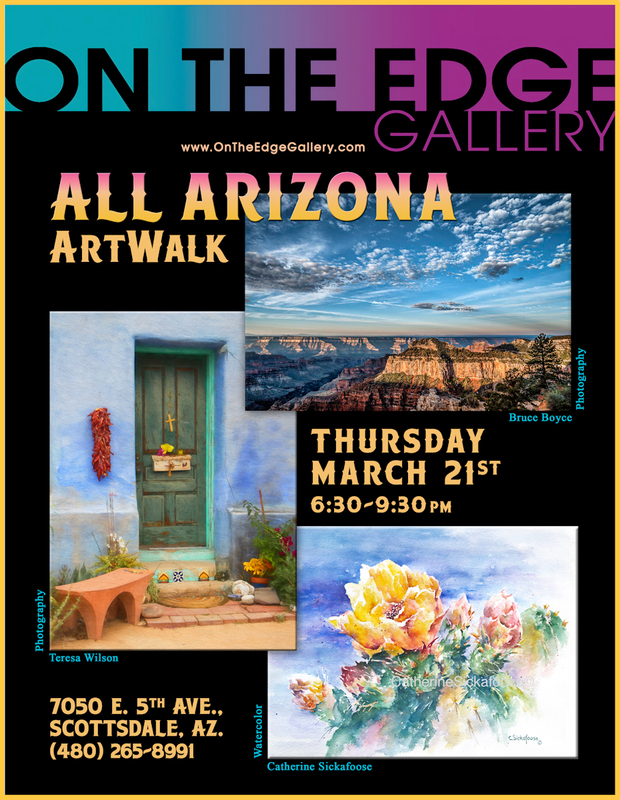 On the Edge Gallery will be showcasing three or our artists who capture all that is Arizona through their artistic journey on Thursday night, March 21st from 6:30 - 9:00pm. These artists capture their interpretation of our beautiful state and are eager to share their insights with you. Our featured artists are Bruce Boyce, Catherine Sickafoose, and Teresa Wilson. 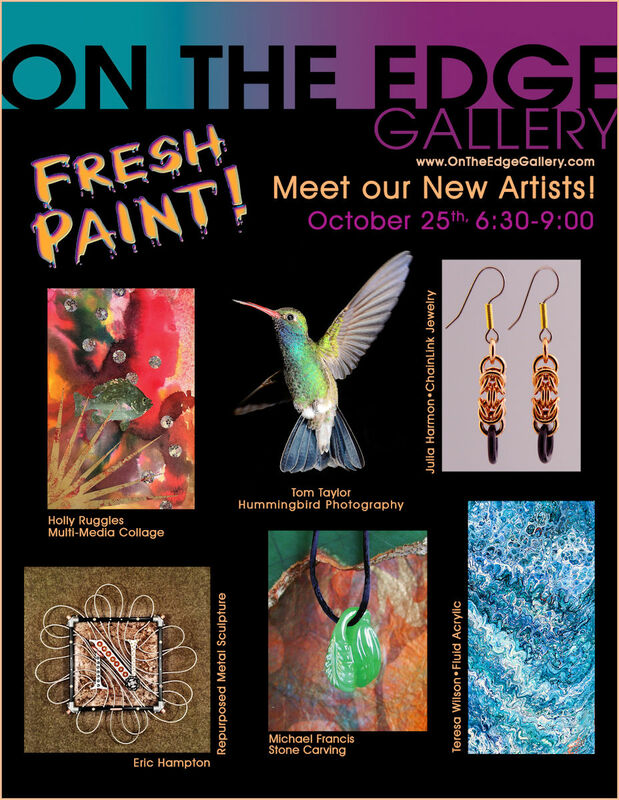 On the Edge Gallery is mixing it up. 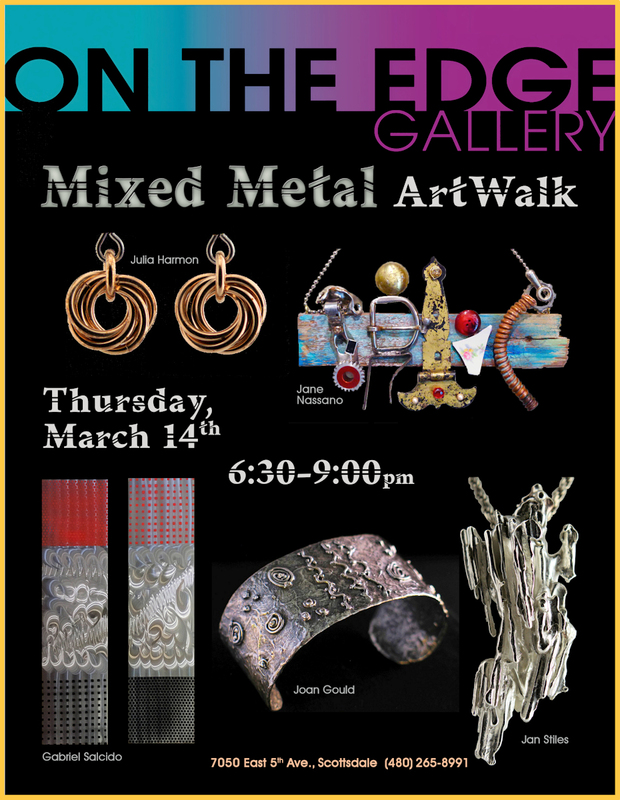 Six of our very talented artists will be on hand to share their creations in metals on Thursday night, March 14th from 6:30 - 9:00pm. These artists have been exploring the art of working with metals and they will share their adventures, inspiration, and art. Featured artists are Joan Gould, Julia Harmon, Jane Nassano, Gabriel Salcido, and Jan Stiles. 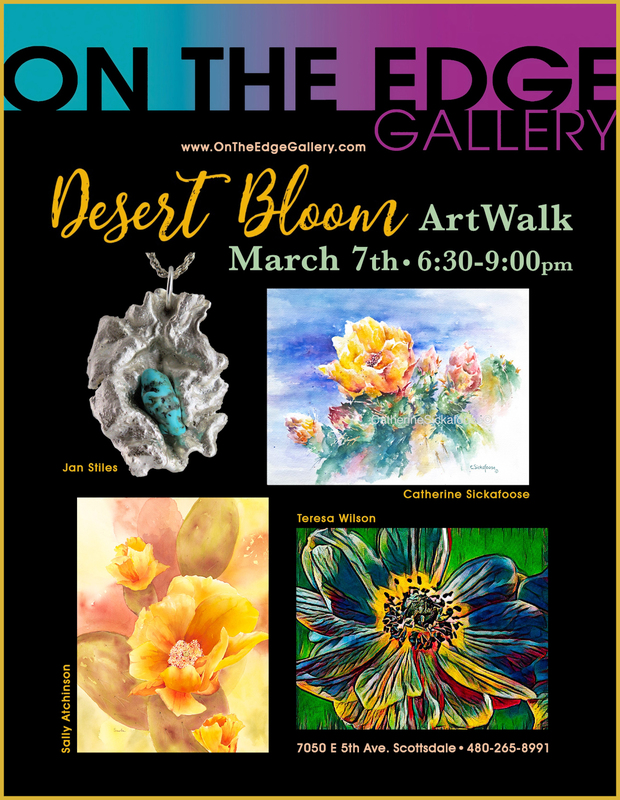 On the Edge Gallery will be showcasing four of our artists who create beautiful desert scenes on Thursday night, March 7th from 6:30 - 9:00pm. These artists love our exquisite desert scenery and capture the beauty of our environment in their works of art. Featured artists are Sally Atchinson, Catherine Sickafoose, Jan Stiles, and Teresa Wilson. 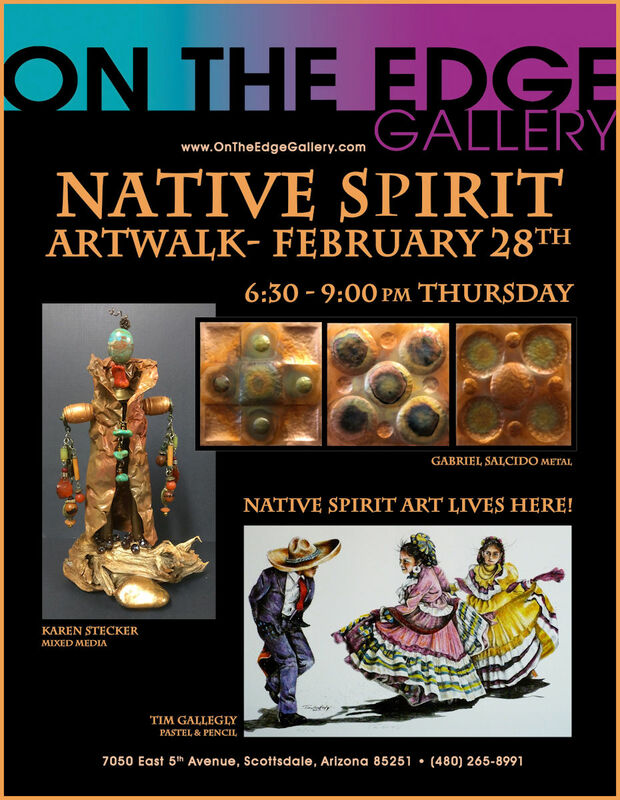 On the Edge Gallery will be showcasing three of our artists who capture the Native Spirit through their artistic journey on Thursday night, February 28th from 6:30 - 9:00pm. Featured artists are Tim Gallegly, Gabriel Salcido, and Karen Stecker. 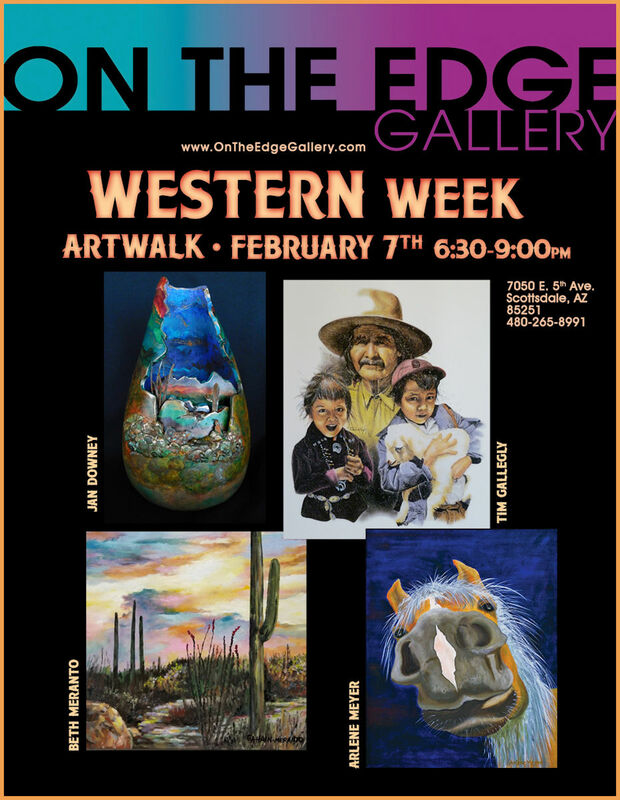 On the Edge Gallery will be showcasing our "best of the west" with four of our talented artists for Western Week Artwalk, Thursday night, February 7th, 2019 from 6:30 - 9:00pm. These artists have been perfecting their styles for years and are eager to share their southwest creativity with you. Featured artists are Jan Downey, Tim Gallegly, Beth Meranto, and Arlene Meyer. See the artists create their own unique works of art, and you'll learn how they do what they do. We encourage the aspiring artist or art patron to connect with their own creative inspiration. Come discover what it's like to be an artist! On The Edge Galley invites you, your friends, and family to participate in this exceptional event and enjoy doughnuts while you're here. The artists who will be demonstrating are Jan Downey, Julia Harmon, Valerie Hildebrand, Jan Stiles, and Cal Vander Kooi. The Arts District in Old Town Scottsdale is in full swing this season with Scottsdazzle! 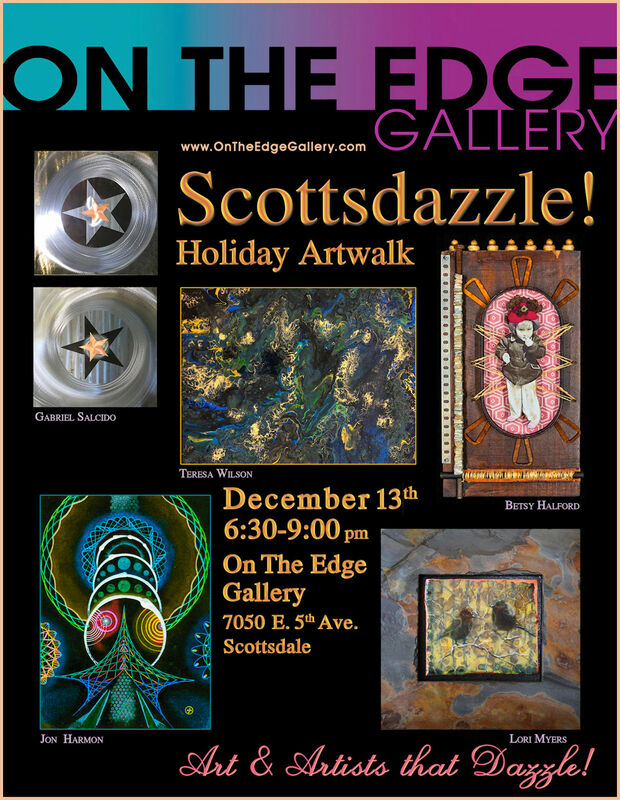 lighting up the town, and On the Edge Gallery is celebrating with our own dazzling artists and artwork at the Scottsdazzle Artwalk. 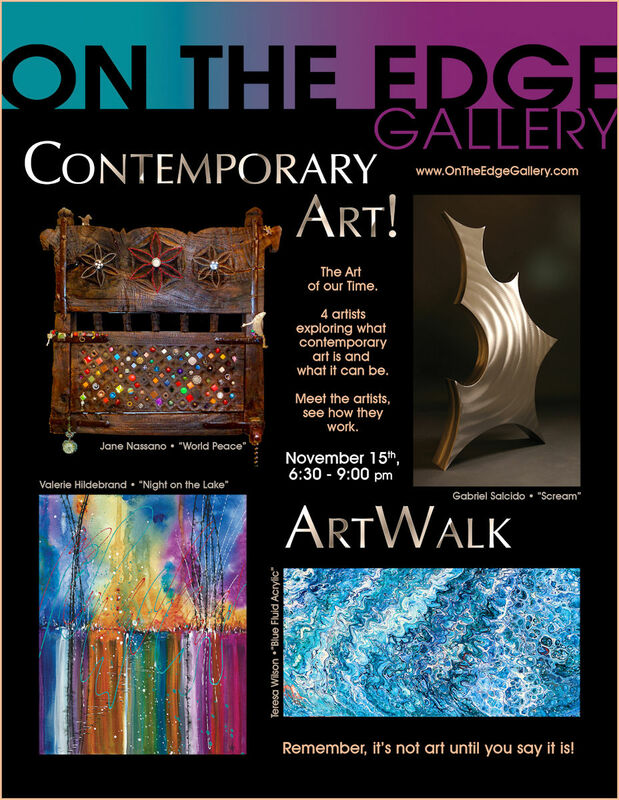 Start your Artwalk at On the Edge Gallery, the first gallery on the tour, next to the famous Horse Fountain and meet our featured artists! They’ll be demonstrating and exhibiting new works of art never before seen at the gallery and created just for this holiday artwalk. Featured artists include, Betsy Halford, Jonathan Harmon, Lori Myers, Gabriel Salcido, and Teresa Wilson. 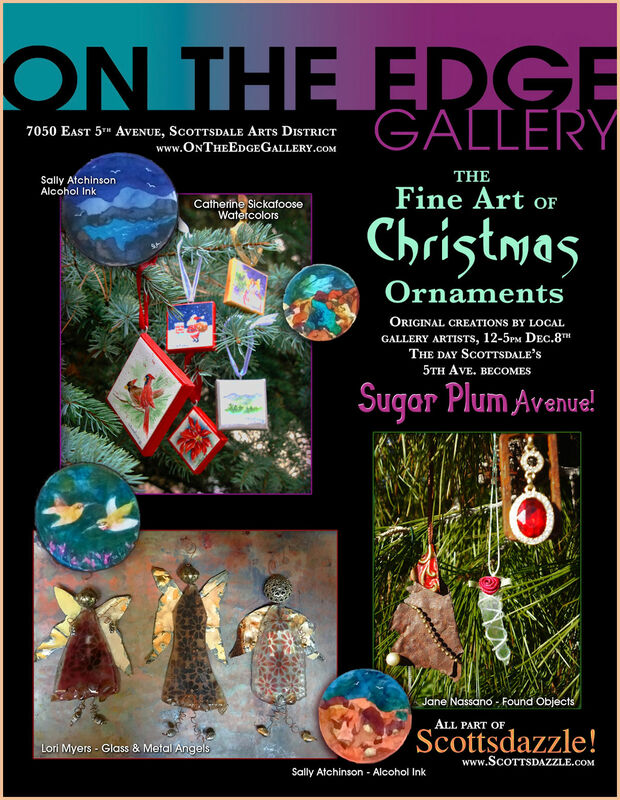 Original creations by our local artists featuring, Sally Atchinson, Lori Myers, and Jane Nassano. The Art of Our Time. Artists exploring what contemporary art is and what is can be. Our featured artists are Jane Nassano, Gabriel Salcido, Valerie Hildebrand, & Teresa Wilson. Once a year we invite new local creative professionals to join the gallery and bring in fresh artwork, even if the paint is still wet! So we’re hosting a party for them, and for you, so everyone can see this eclectic new work, never before seen at On the Edge Gallery! You’ll get to meet all the new artists up close and personal, hear their stories, and discover how each of them creates such fresh new works of art. Join us for food, refreshments, all our existing artists too, and have some artistic fun! Art should be accessible! 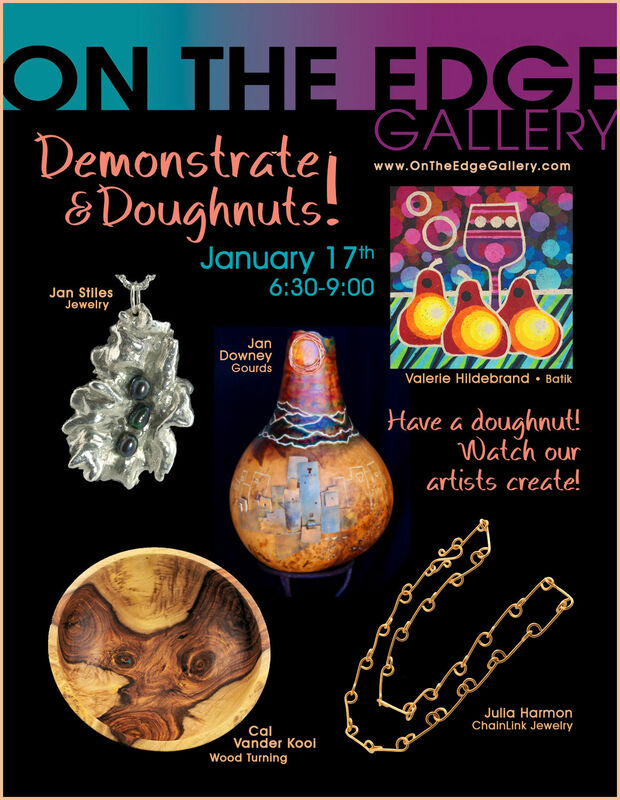 Whether it’s your first time at On The Edge Gallery or you’re a seasoned collector, at the Demonstrate! ArtWalk you’ll see creativity come alive! Our talented artists will be demonstrating their creative processes in real time during the Artwalk in Downtown Scottsdale. Meet and interact with artist Susan Feder, as she sculpts whimsical figures, all wearing her signature “Red Boots,” in fiber clay. Rick Fitch will throw beautiful vessels on his potter’s wheel. Watch as Karen Stecker uses bits of metal, wood, gemstones and found objects to create ‘goddesses’ from cultures around the world. Cal Vander Kooi will be turning local Arizona woods into stunning creations on his lathe. See these artists create their own unique works of art, and you’ll learn how they do what they do. We encourage the aspiring artist or art patron to connect with their own creative inspiration. Come discover what it’s like to be an artist! 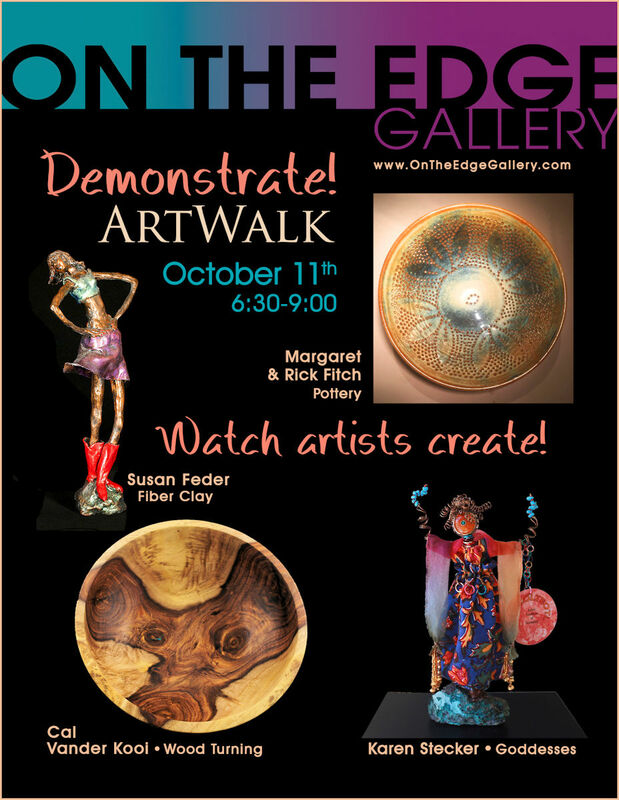 On the Edge gallery invites you, your friends and family to participate in this exceptional event.